On September 21, 1996 one of America’s most eligible bachelors married his sweetheart, Caroline Bassette while dashing the hope of millions of young women. They had an ultra secret wedding on the remote Cumberland Island off the coast of Georgia and spent their honeymoon in a yacht away from the media. The ceremony begin near 7:30 PM just after sunset. The timing of the wedding emphasized autonomy, tradition and the promise of children. This is a marriage for the creation of the next generation. 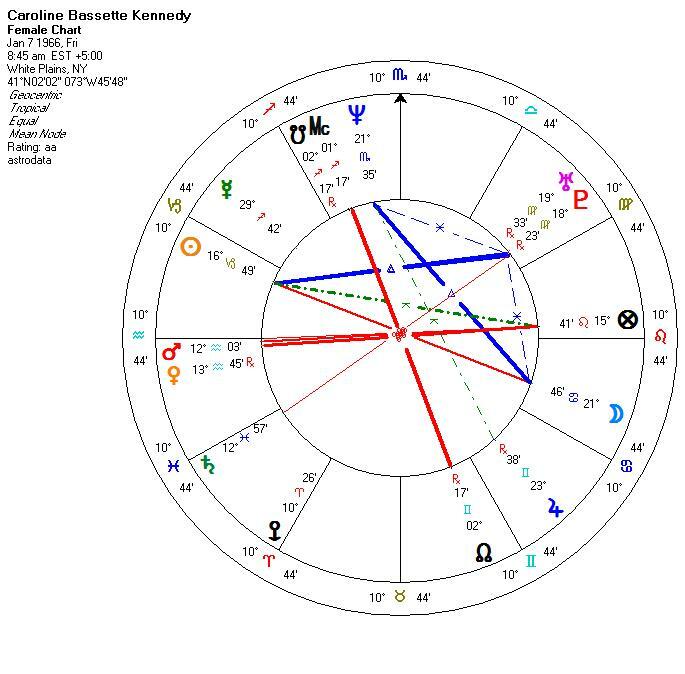 The wedding Moon was strongly placed on Caroline’s Sun indicating that actions taken would favor her. This Moon was also placed on John’s Saturn that emphasized the harmony of tradition with the feminine. It stressed conservative values and the formalization of commitment, duty and responsibility. The wedding Venus pointed to Caroline’s intention of marrying for love and affection. John’s personality shows a need to change society for the better. There can be a bit of the social evangelist in him that is married with practicality and the willingness to work hard to achieve his goals. He is free spending with his money to achieve his ideals that he has started to form with his political magazine George. He can be restless with the need for variety in his life especially women. He is basically not a one woman man and it is likely that he could marry more than once or have liaisons with other women. His temper is slow to burn and he can endure the necessary frustration it takes to accomplish long term goals. He has a need to be his own boss and he wants his work to reflect his philosophy in life. He was born on 11-25-60 at 12:22 AM in Washington, DC. Caroline is a conservative Capricorn that is cautious with money and conservative with her feelings. She needs security and stability. She has an original mind with new ideas and may have some mechanical ability. She likes her love relationships to be filled with fantasy, sexually intense and unconventionality behind closed doors. She fits in well with society, works well within the establishment and can effectively utilize her social connections to get her ideas heard. Her birth date is 1-7-66. The attraction between them is complex but many interconnecting points between these two people can tightly bind them together. Her Moon falls on his Mars and her Neptune squares his Moon. She is the sexual fantasy that he is attracted to and he is strongly drawn to her physicality. Her Saturn is sextile his Saturn and her Sun is on his Saturn. They both represent the needed social respectability that they both want in their lives. They are complementary in their view of tradition and social status. She will give him more stability and help to calm his impulses in the outer world of public view. His Neptune aspects her Mars and Venus so the sexual attraction is mutual. Their idealism of each other can feed and change with the times as their relationship matures. The question remains that when the times ripen for John’s eyes to wander, will the stability that they receive from each other overcome the emotional rift of a possible affair? That is a possibility in the future as his attractiveness and celebrity will present him with opportunities all his life. Sadly, JFK, Jr. died in a private plane crash as the pilot with his wife Caroline and her sister on July 16, 1999. The plane took off at 8:38 pm from Fairfield, NJ. He was an inexperienced pilot and they encounter fog. 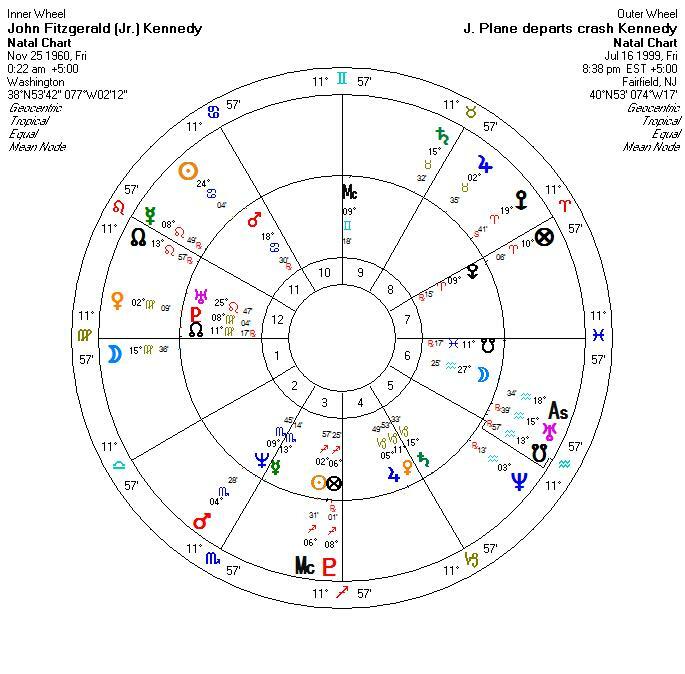 This chart is not strong for a crash, perhaps the time of the last radio transmission might add more but it would only change the ascendant degree. The transiting lunar nodes are with transiting Uranus and square transiting Saturn. 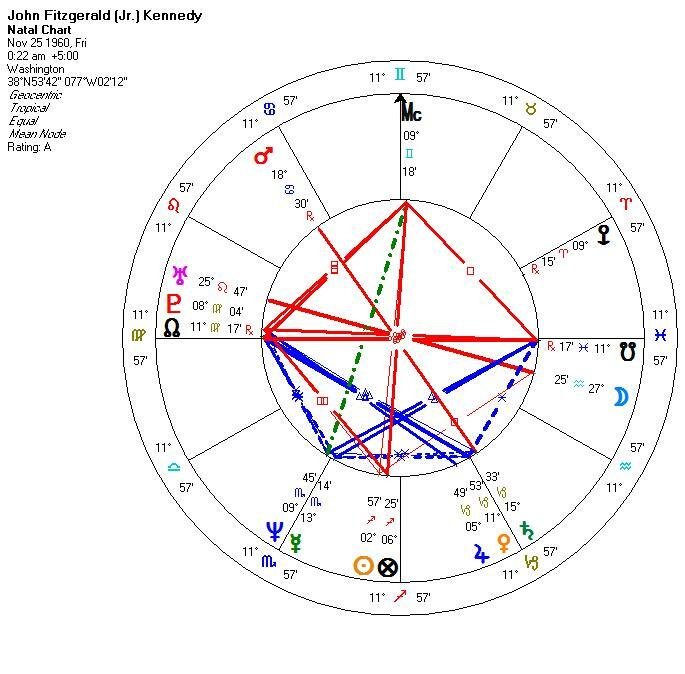 tSaturn opposes JFK, Jr’s Neptune which is squared by tMercury. 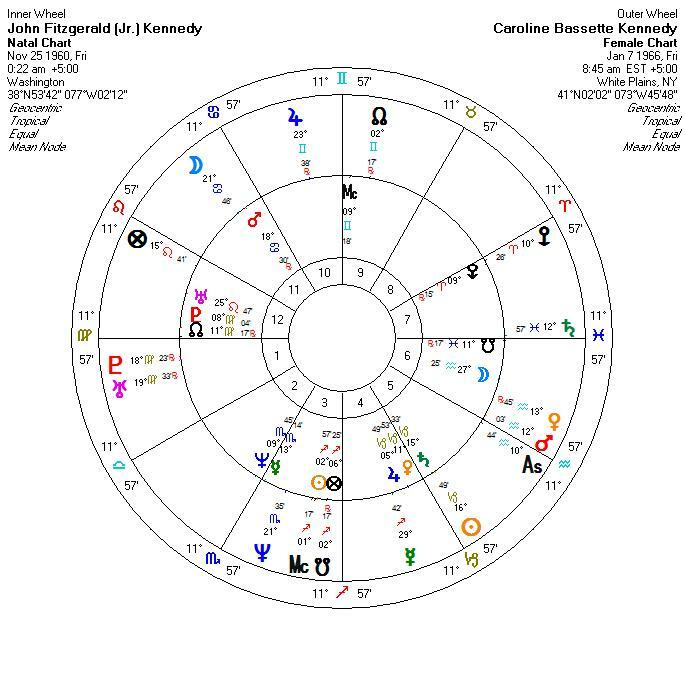 This forms a grand square in fixed signs but again I don’t see this grand square as predictable. Transiting Mars is square tNeptune and that is a good indicator of fog and losing directions, being lost. Just not enough to give a strong warning of disaster. The range in transiting aspects were not exact.